I don't really like the appearance of Cursed Birman and widget. I wish they had a little more Halloween apparel or something to make them look more festive. Like the pets received from other holidays. Even Naxxy (as cool as it looks) , could just be another pet unrelated to hallows end (except for the bats flying around it). Just noticed a strange interaction with this pet, makes it seem a lot stronger than I originally estimated. This only works when faster than your opponent, but you spirit spikes followed by prowl. If they hit you on the turn you prowl, spirit strike damage is increased by 150%, without consuming the prowl buff! Letting you spirit claw (preferably) with for the prowl buff. Forgive me if this is common knowledge but I enjoy the combo. With 289 speed Spirit Spikes is viable vs pets who are slower. I mostly see Birman as being a support pet with a really powerful racial. I did all of the candy buckets today and managed to collect enough candy for the two new pets. My initial thought is that Birman is a better looking pet, Widget the slightly better battler. Birman's moveset has Call Darkness, but no move to work off of to make a power combo. Definitely take Spirit Spikes as a slot 2 move. Spirit Spikes isn't a bad move for pve, but anyone with any pvp experience knows just to not hit you for a round. Not the best pet in the world but also not bad either. As said it does work best when buddied with a moonlight caster to boost its skills. Also people remmeber you can gather topins across more then one toon. I found Northrend, Outland, and Eastern Kingdoms quickly gets you the 150 you need. Repeat across other toons and you're set. I'd only do them all if you only have one/two toons or don't have the achives yet. 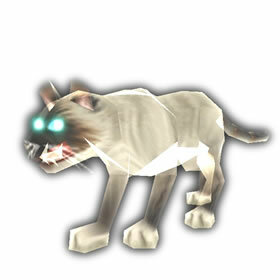 It is like an undead Feline Familiar. Prowl + Call Darkness will hurt alot. A bit too slow to use Pounce to best effect. But it also has a quite interesting Moonlight-team ability set. Spirit Claws will always hit in Moonlight, Spirit Spikes does 10% more damage and if you get a Devour off it will heal for 25% more. Just need to find it two other Moonlight partners(Celestial Dragon/Nether Faire Dragon/Infected Squirrel/Sporeling Sprout, perhaps. Solid pet, but don't expect fireworks. I haven't even finished the Candy Buckets yet and I was able to get both pets. I have barely started Pandaria. Hoping to be able to do the dailies and get at least one more pet before Hallows End finishes.